Kef is a long standing audio brand but hasn’t been in the headphone game for very long. We reviewed its first pair, the M500, two years ago. The firm now has a small range of cans including in-ear headphones so here’s our Kef M100 review. According to Kef, the M100 headphones are “Supremely comfortable lightweight in-ears combining Kef design innovation and precision engineering to give you true high resolution sound on the move.” so we’ve put them to the test to find out if this is true. You can pick up a pair of good sounding in-ear headphones for under £50/$75 and if you’re on a tight budget then head over to our best budget headphones chart to find a pair. 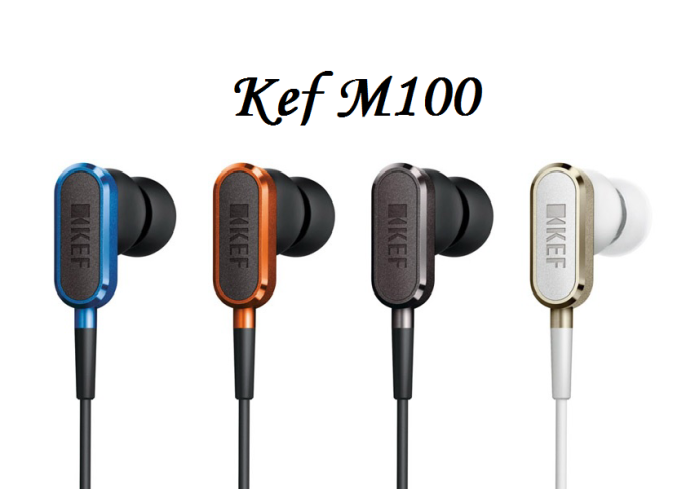 However, as you might expect from a brand like Kef, the M100 in-ears are not quite so cheap. We like to predict the price of products that we get in for review before looking up the actual price and we were pleasantly surprised to find the M100 headphones are available for £119/$180 – we were expecting a price tag of at least £150/$225. That makes them cheaper than the RHA T10i which are £149/$224 and on par with the Rock Jaw Kommand in-ears. Like Kef’s new M400 on-ear headphones, which we hope to review soon, the M100 in-ears are available in four different colours: Racing Blue, Sunset Orange, Champagne Gold and Titanium Black. We took a look at the latter which is arguably the most boring option but they do look stylish. You can rely on Kef to provide well-built products and these headphones are no exception with a machined aluminium casing making them fit with other M-series cans. We like the ‘racetrack’ bevelled edge which looks like an indie-car track. Another plus is that the production process is an environmentally friendly benzene-free one. Included in the box alongside the headphones are three different sizes of tips, a round carry pouch and a flight adapter. We’d also recommend you put the tie-clip onto the wire to avoid the headphones pulling downwards and out of your ears when in use. That said, these are small and light in-ear buds which is a real plus point after seeing so many which are too big and heavy to stay put for longer than half a song. If you need extra support, perhaps for running, the Kef M200 in-ear headphones have ear hooks. That lightweight design (just 18g) and the angular design combine to make a comfortable experience. I tend to have a bad time with in-ear headphones but I’ve been able to wear the M100s for long periods without reaching unbearable levels of annoyance. Everyone’s ears are different but I’ve been able to use them all day (bar lunch and meetings) quite happily. That said, the Bose QC20 in-ears are still the most comfortable I’ve ever used. The in-line control is made for use with Apple products (iPod, iPad and iPhone) but will work with ‘ most other devices’. On an Android phone we could play, pause and skip forward a track but not adjust the volume. Alongside that angular design – both the shell and chamber are angled to help the fit and aim to minimise distortion – is a 10mm ‘full-range’ neodymium driver. This sits on a high density foam acoustic dampener and a vented driver radiator, which together, form what Kef calls a ‘low resonance acoustic suspension ring’. All of this combines to provide ‘high resolution sound’, according to Kef. Kef calling the driver full-range means it can deliver frequencies from 20Hz all the way up to 20KHz – in other words the hearing range of a human being. From the off we could tell the M100 in-ear headphones had the potential to perform well but as with the M500, they needed running in before they could reach their potential so bear this in mind if you get a pair. It took a good couple of weeks before we felt the M100s were run in properly and the main area we saw improvement was the low end. Bass sounded quite frankly poor to start with but does come alive over time. That said, we don’t think the M100s are the best for all you bass addicts out there. What these in-ears do provide is a balance across the entire frequency range so it’s actually quite nice that the bass doesn’t simply assault your ear drums in a vain attempt to impress. Kef says that the response is more accurate so you can hear each vocal or instrument clearly differentiated and we’d have to agree. These headphones are super crisp and bright but without going too far and becoming harsh. Balance is the key word here and that makes them suitable for a wide range of genres. Aside from physical design, this is another reason why they are good for a long listening session. We were impressed by Kef’s first headphones, the M500 on-ear cans, and the M100 in-ears are really no different. They offer excellent build quality, a lightweight comfortable design combined with nicely balanced and crisp sound performance. They’re also not as pricey as we had expected making them a solid choice for a pair of in-ear headphones.